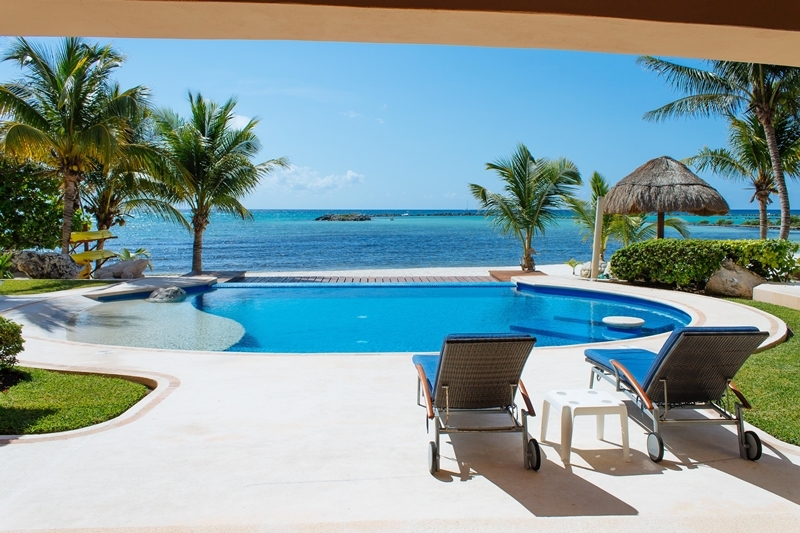 Villa Bahia Nautica is a modern, stunning and sophisticated home located on the beachfront shores of Fatima Bay in Puerto Aventuras, featuring timeless character and only a short stroll away from restaurants, shops and the village quaint ambiance. You enter through the main gates of Puerto Aventuras, and then pass through the home security gate. Your protection and privacy is relished 24 hours a day here. The majestic villa is aprox 6500 square feet of living space built to exceed U.S. standards and to showcase custom design. The villa features a roof top palapa with a double chaise lounge and wet bar with seating amazing multi level beachside pool, deck area and guest kayaks. The villa boasts 4 elegant bedrooms. Oversize master suite with ensuite bathroom with double vanity, double shower and walk in closet is located on the ground floor. From the master suite you walk out to the Jacuzzi and deck area! 3 more bedrooms with ensuite bathroom and walk in closets are located on the upper floor. The kitchen is functional and spacious, with professional-grade custom selected appliances and clean-lined cabinetry, the kitchen space is designed for both cooking and entertaining, and functions as a place of gathering for friends and family. There are several spaces to relax throughout the house. The family room is fabulous, and is oriented to focus both inward on intimate views within the site, and outward, to the sea. The upper floor has a large comfortable media area with huge flat screen TV with satellite. From here stairs lead to the amazing roof deck with palapa, wet bar, full chaise lounge and seating area with cushions. The roof terrace area is ideally suited for entertaining. Relax, take in the beautiful surroundings all with amazing Caribbean views. Like all of the ultra luxury vacation villas, special attention to detail is evident in the creative hand-cut stacked stone wall, beautiful iron work, stunning water feature out the house, rich hardwoods and dramatic and elegant custom made and hand picked furniture throughout the house. Incorporating elements of luxury through a natural use of indigenous materials and an open, modern aesthetic interior and exterior space to experience graceful tropical breeze and the seductive and calming views of the expansive ocean. The house was designed to enhance the beauty the inherent beauty of Mexico's Riviera Maya, Caribbean Resort culture is lux living in nature. 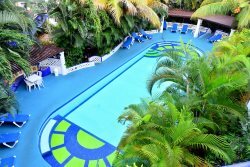 Infinity pool and white sand, conveniences such a full service staff, concierge service and much more. This home leaves guests with little reason to leave, but amenities such as the golf course, tennis courts and beach await within this gated luxury resort. Come and enjoy the ancient Mayan culture find out how you can explore more of your Mexico vacation, from Puerto Aventuras is not far from famous Playa del Carmen, Xcaret, Cozumel, Xel-ha, Tulum, Akumal and Coba. BEDROOM & BATHROOM Lower Level. © 2019 | Caribbean Realty Puerto Aventuras - All rights reserved.